Travel the Text works in coordination with churches, schools, and organizations to facilitate travel and study opportunities in the land of the Bible as a part of your ministry, curriculum, or organizational development. We host group sizes between 25-45 participants for these intimate study program experiences. Group leaders, as defined by Travel the Text, are the individuals from a church, organization, or community who inspire a following to embark with us on an incredible journey to the land of the Bible. Group leaders consist of pastors, church members, or community leaders with a vision to create a program or opportunity involving this incredible experience. What are Group Leader Responsibilities? Communicate with Travel the Text to customize the ideal itinerary suitable for your group and situation. We have recommended itineraries, and cost varies depending on level of accommodation, length of trip, time of year, and group number. Assist with distribution and collection of group registration documents, deposits, and final payments. Responsible for submitting group registration documents and payments to Travel the Text in a timely manner, as defined by specific arrangements made between Group Leader and Travel the Text. We are happy to assist the group leader in meeting these goals in the most efficient, stress free way possible for both the leader and group members. Travel the Text will work with group leaders to determine the best flight options for each group with the goal of everyone arriving and departing on the same flight for ease of travel. Group leaders will communicate the flight plans to the group, and assist as needed (along with help from TTT) to confirm all flight plans for group members. Group leader will act as liaison between group members and Travel the Text prior to trip departure. Group members will contact group leaders with specific questions regarding group travel, expectations, needs, etc. Group leader will then streamline questions and information to Travel the Text to maintain efficient and consistent communication. Each group leader prepares their groups for this journey in unique ways. Many offer regularly scheduled group meetings in the weeks leading up to the trip for times of prayer, group development, Biblical study preparation, and/or to review travel and packing guidelines. Travel the Text has pre-trip study materials available, and can make additional recommendations specific to your group's itinerary and study focus. 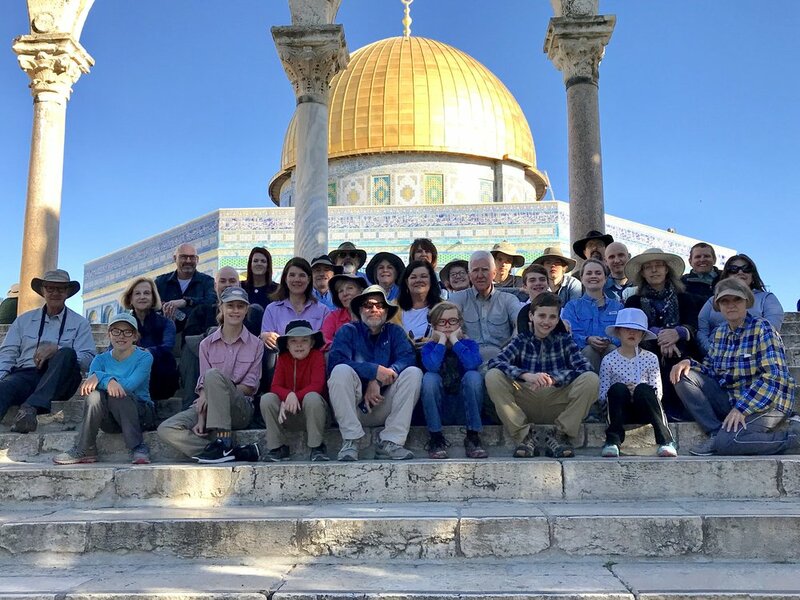 For an additional fee and as scheduling allows, Geoff Carroll offers an orientation seminar, and will travel to your group prior to the trip, to provide trip information along with inspiring lessons from the land of the Bible. This will get your feet wet in anticipation of this journey and also provide a good opportunity to bring the land of the Bible to those unable to travel who want to experience some of the land. Group leaders have a powerful platform for ministry opportunity; from recruiting and inspiring others to commit to this life changing adventure, to Biblical study opportunities and group development prior (and during, as desired) the trip. Group leaders work hard to make this dream a reality for many. Therefore, the Program Fee for group leaders who bring a minimum of 25 paying group members is waived by Travel the Text. Additional privileges and discount opportunities may apply to your specific group/program situation. Contact us for more information and for an official quote. Once your group arrives in Israel, Travel the Text will take over. Group leaders are welcome to maintain as active a role as desired, such as teaching on-site, holding group meetings, devotionals, etc., but Travel the Text staff is available to assist and help meet any group member needs from the moment you arrive. You’ve worked hard for this trip and upon your arrival we want to carry the leadership burdens on your behalf as much as possible. Let us know how we can help; you’re our V.I.P. Sea of Galilee, taken at sunset from one of our most recommended accommodations.